While there are plenty of bikes in the market that rate as capable all-rounders, our goal with this Shimano/Giant project bike was to create a worthy race bike that could be built up with a budget-friendly parts spec in mind. Whereas Canyon has made a name for themselves by producing low-priced performance bikes by cutting out the dealer base, Giant has long been able to produce cool bikes at attractive price points and maintain a strong dealer base because they own the factory that makes their bikes (as well as many of their competitors). 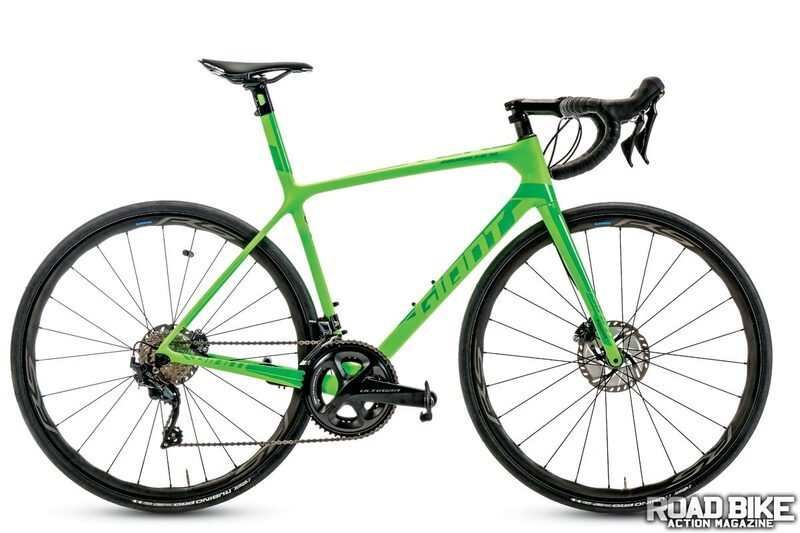 Although Giant makes three versions of the TCR Advanced SL, it was the stand-alone, bright green, $2400 frameset that caught our attention (actually, we first laid eyes on the $2700 pink Maglia Rosa version, but lost interest in the Giro d’Italia celebratory colorway when we found it was only available with rim brakes). The lowest-priced complete TCR Advanced SL available is $6325 with a Shimano Ultegra Di2 drivetrain. 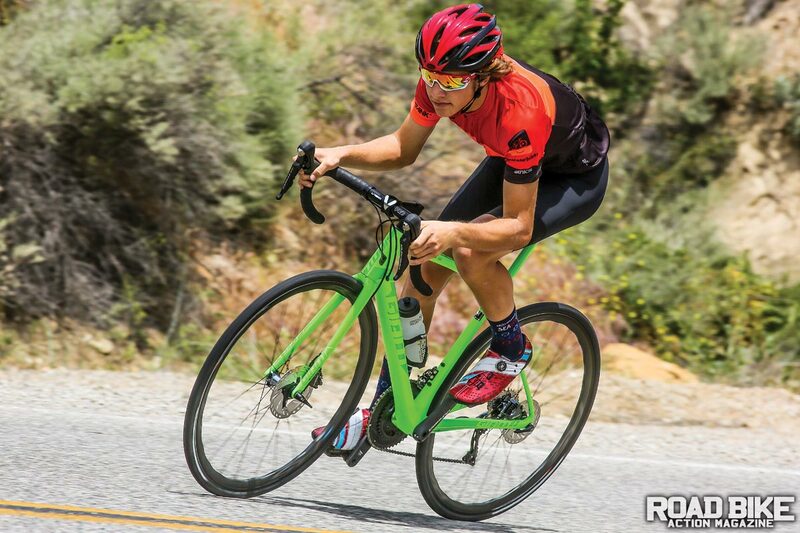 When it comes to Giant’s performance-bred road bikes, compact frames with integrated seatposts have been the norm for years, and the TCR is one such bright, shining example. 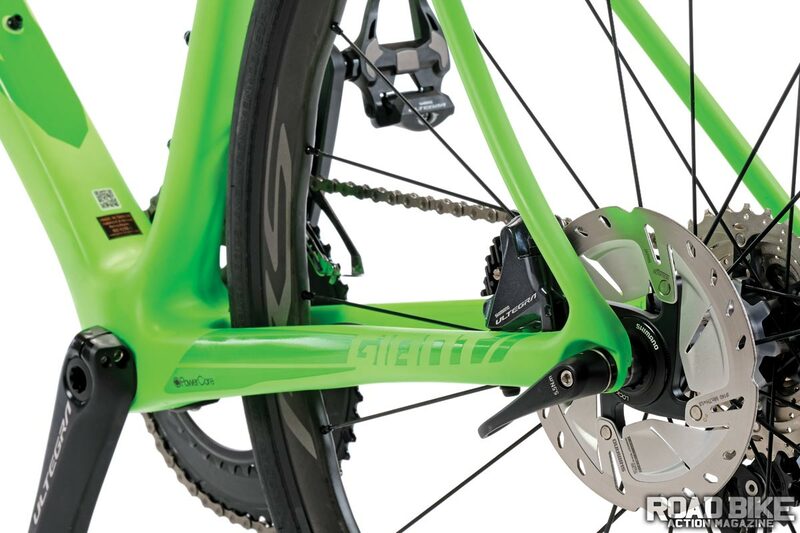 One other feature that helps the Giant stand out is their proprietary Overdrive 2 steerer/headset combo that uses a 1.5-inch lower bearing and a 1.25-inch upper bearing, which also requires an oversized stem. Our test bike rolled on 28mm tires, which were likely as big as you can go without incurring clearance issues with the chainstays. Flat-mount brakes, 12mm thru-axles and internal cable routing (frame not fork) are routine. The Bluetooth- and ANT+-friendly RideSense data transmitter that’s integrated into the left-side chainstay is a nice value-added accessory. One of the downsides of Shimano’s great-working, price-friendly Ultegra Di2 drivetrain has been the degree that it has overshadowed its equally even-friendlier-priced mechanical shifters. No, not as split-second quick with shift performance, but truly as capable and efficient performance as anyone would require. Though not aesthetically pleasing, Shimano hydraulic disc brakes are consistent and powerful. The wavy, tubeless-ready, 24-spoke Shimano RS770 Disc wheels ($750) run with a faux carbon wrap, which, in addition to aesthetic trickery, is intended to also provide added rigidity. The alloy/carbon hoops were mounted with Vittoria Rubino Pro tires. Although we requested front and rear 140mm rotors, Shimano stuck to their 160/140mm protocol and threw the bigger rotors on up front. Call us fashion-first shills, but in addition to all our braking needs being handled just fine with 140s up front, the 20mm-larger rotor just looks so unsightly. Adding to the eyesore appearance, unlike the blacked-out Dura-Ace versions, the Ultegra rotors have a distinct pie-pan look owing to the ICE cooling fins. Cockpit duties were handled by an aluminum duo from Pro Components (a subsidiary of Shimano). The Pro parts are renowned for their sturdy construction, and the Vibe stem and handlebar fit that bill. 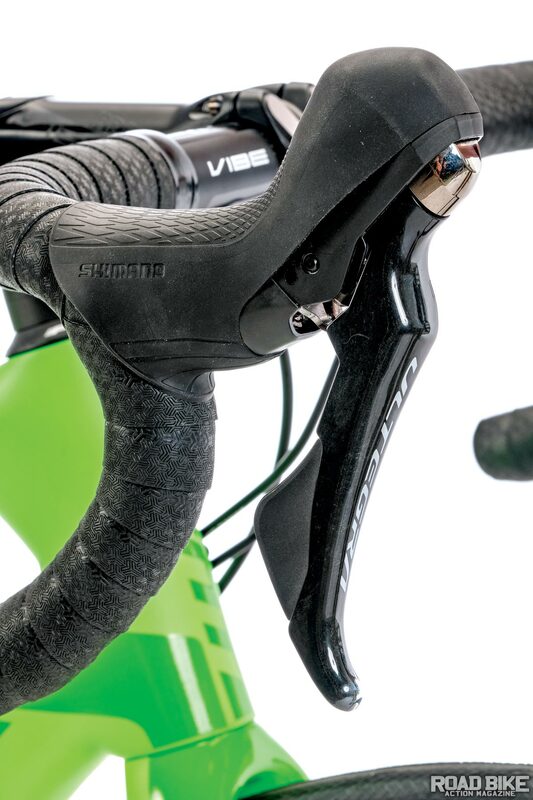 The reverse-mount face plate on the stem may make perfect sense to an engineer, but it is a pain to adjust. Shimano’s mechanical Ultegra drivetrain is a boon for any up-and-coming racer. Speaking of a pain, in order to adjust the seat height, after you cut the post to fit your leg extension, Giant also supplies a variety of spacers that fit inside the shorty seatmast for added adjustment. It’s a bit primitive really, especially when your friends walk into the room and find you shaking the frame upside down as you try to evict one of the spacers that inadvertently fell inside the frame. In short, the SL is a ripper. Between the compact frame and oversized steerer, the bike loves to go as fast as you can pedal it up and as fast as you can hold on to it going down. There is some road chime felt through the oversized front end. On our bike the stem would also occasionally loosen. As much as we fancy ourselves capable bike riders, the TCR opened our eyes wide when we hit our first fast and furious descent. Two words: hold on! No doubt aided by the 98cm wheelbase, the Giant dropped in like a laser-guided missile, and if you got lazy, it would take you for a ride. In addition to being an early adapter of the compact frame shape, Giant also helped pioneer the ISP design, which attracted fans and frenemies when it came to judging the ride quality provided. We can now say that when it comes to looking for added compliance, more can be found among the legion of new bikes that use small-diameter posts with internal binders that bring even more flex. When it comes to buying a race bike, the most important thing to remember is that virtually any bike can be a “race” bike. And even though most bikes on the market could qualify as a good-enough race bike, there are some specific traits (weight and geometry) to consider if you plan on being a serious racer. Like we said up top, the idea with the project bike was to try and find a more economical counter to the legion of both high-end racing frames that often sell for over $5000 and complete bikes that sell for over $8000. With our Shimano Ultegra-spec’d Giant TCR Advanced SL, we think we’ve found one. When it comes to their catalog of cool bikes that don’t bust the bank, there’s more in store from Giant than just road bikes. 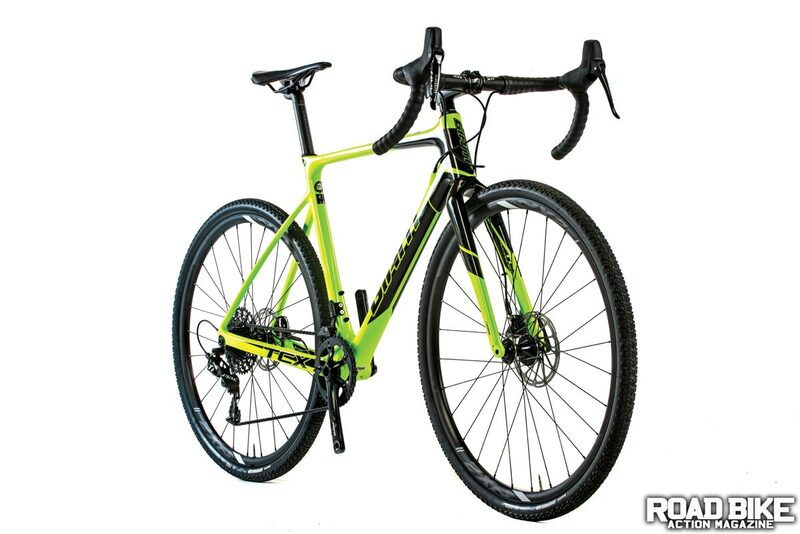 The TCX Advanced SX offers anyone who desires some added versatility to ride cyclocross or—gasp!—a tad of gravel in addition to the road for the wallet-friendly price of $2120. Giant’s four-model ’cross/dual-purpose bike line starts at $1430 and slides up to a racier ’cross model at $3375.